Emcees Jessica Cernadas and Veralyn Williams open DWF 2011. Last Saturday, The LAMP joined Radio Rookies, RHI Radio and Radio Rootz to present the first annual Digital Waves Youth Media Festival at The Greene Space in Manhattan. 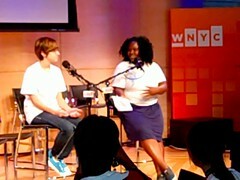 Teens learned how to create their own audio for free, what’s so special about a radio story versus a visual story, techniques for critiquing other work and much more. The LAMP is running the DWF blog, adding new updates and reflections on the event as they come in from attendees. We’re also building a set on Flickr of all the photos taken over the course of the day. Click here to read participants’ thoughts and stories from the day, and check out the ongoing Flickr set. You can also follow The LAMP on Twitter to catch more updates as they come in. If you were there, please email us with your pictures and blog posts!